Our cigar pens are one of the largest ballpoint pens we offer. It's perfect for those who prefer a beefier, heavier pen. The ultra version provides a few classically elegant elements such as the rope twist accents on the clip, center band, and finial. Overall, this is a perfect pen. The transmission has a double twist element, meaning you can twist either left or right to extend the refill. It will provide many years of consistent service. This accepts a parker style refill and comes with a high-quality tungston ball point reffill in black.Other colors and Gel ink are available. 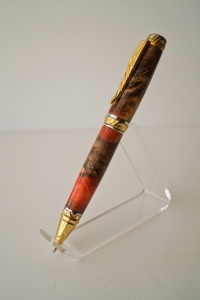 The pen is dresed in a stunning example of buckeye burl that's been dyed Red. The Intricaticies are of the grain pattern are simply stunning. This pen is an eyecatcher!